I don’t know which trees Joyce Kilmer had in mind when he published his collection ‘Trees and other Poems’ in 1914. But since he was an American (journalist and poet), I suspect he would have been talking of elms, oaks and yews that he was acquainted with. The first stanza of his ode Trees is remarkable: I think that I shall never see/A poem lovely as a tree. Just when Aishwarya Rai Bachchan is keeping mum on the issue taken up by her detractors [her weight], her choice seems completely in sync with the eastern ethos of how women must function. In contrast, some weeks back we saw Ashley Judd slamming all her critics who had been grossly assaulting her on her “puffy face.” Anyone who has followed what happened there must have felt a real surge of reverence for Judd, regardless of whether one is a feminist or not. Art Beat: National Child Art Exhibitions , June 11 to 13 at 5pm at Alhamra Art Council, The Mall. 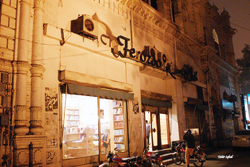 As far as I remember Ferozsons was a premier bookshop in Lahore since late 1950s. Usually there were small shops on Mall road with books stuffed in poorly. But Ferozsons stood out because of its space and the variety of books for book lovers. The books were of general nature, not syllabus books, that were available at Imperial in the same vicinity. A spicy steam-roast chicken or deep-fried chargha available for just Rs 160! That’s strange — the fact that a large number of roadside food outlets are selling the product at this price in the city. For example, the fish shops on the road leading from Qartaba Chowk to Chauburji are offering steam-roast at unbelievably low price. Unable to sell a fraction of the fish stock they sell in winter, chicken is a safe bet for them these days. In a bid to outdo each other, these shops offer amazing discounts to prospective clients who have to think more than once to take a decision. The poem, all twelve lines of it, is a beautiful, heart-warming appreciation of trees that one can scarcely go any better. But have you ever stopped to put your face against the smooth bark of the peepul or the rough one of a tahli or neem and imagined you can hear the sap coursing through its veins? The sap that carries the songs of several decades and, in the case of some fine old banyans, even of centuries. I have, and I have heard songs and tales and have seen events unfolding as the tree saw them. But then I suppose I am a sentimental old dreamer. We don’t do these things. Because now as Lahore expands unplanned and uncontrolled, the ancient trees are being destroyed to be replaced only by shrubbery and fast growing species like rubber plant, asoka and, lately, cornucopus. As we are in too unholy a haste to get nowhere, similarly we are in greater haste to see these grow, trees that do not belong on this good land. My gripe apart, this is the season to sing the amaltas (Cassia fistula), the tree of the smooth pale-coloured bark that in full summer has a dense leafy crown much favoured by collared doves, bulbuls, little brown doves of the somnolent coos and, if it is a big tree, by the kuk-kuk-kuk bird – the beautiful green, blue and red coppersmith or chukki rah of Punjabi. 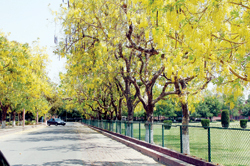 Unlike the tahli, neem or the peepul that shed in midwinter and come back into leaf by April, the amaltas sheds in early May. Then for about three weeks it stands bare, its skeletal branches, smooth and almost white, pointing fingers at the sky, which in this season is always a quartertone of blue. I have so many times stood under a bare amaltas this time of year and imagined it is shaming the sky for losing its azure to the dust and filth we humans have pumped into the sky. About sometime in mid-May, tiny green buds break out on pendent new shoots. But instead of unfurling into leaves, these buds grow fatter by the day until they burst into yellow blossoms. Every day they grow in numbers until the tree, still without its green drape, becomes a very cascade of fragrant gold. It is a flower fall (if we can have waterfalls why not a flower fall) of gold, gold, gold. And the fragrance, oh, the fragrance! I don’t think even Kilmer could have described it. It is as mellow and subdued as can be. Not the overpowering exuberance of Raat ki Rani but no less straight out of some similar mythical paradise. 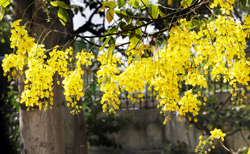 Whereas the Raat ki Rani drowns you so that you do not wish to rise again, the fragrance of the amaltas is only just discernible as it rides the breeze in undulating waves; it uplifts. It is a lilt in the air, a melody and a dance that rolls like the waltz — always smooth, always without a twitch, as if it has oiled the very breeze that carries it. This is the time when the tree also breaks out its new foliage. Not its parrot green of high summer, but a pale brick-red turning to olive, just so to set the gold to blazing advantage. It is the shade of the crown on the tailor bird’s head. Is it the colour then that invites the tailor bird to nest in this heavenly tree when its leaves mature in June? Every morning shortly after sunrise, I stand under the amaltas in my yard and look up through its cascade of gold and brick-red amid the white branches to a sky that is not yet burned to a half-tone by the blistering sun. I stand there for minutes on end until the doves and the bulbuls become nervous with my stare which they assume is aimed at them. With the sun low in the east, the gold of the blossoms catches the slanting rays to shimmer and glint as if it were liquid against the solid blue of the sky. I don’t think there is a prettier sight in Lahore in May through mid-June. And then there are those ripples of fragrance to uplift. Every morning, I have but one regret: why must the amaltas only favour us for, at most, six weeks a year? Why cannot we have it in blossom the year round? But that is the way of Nature. So before it is too late, shake a leg, go out and make friends with an amaltas. You will not regret it. Judd is reported to have said, “Patriarchy isn’t men. It is the system in which both women and men participate.” And from here exactly, I take the opportunity to look at the women at large in this city. All of us have heard of men who stare at goats. But what about the women who stare at other women? All of us have come across them. We have seen them in the shape of random women, our relatives, our friends/colleagues etc. One ‘shocking’ revelation might be that such a woman resides in us. Blekh! Anyhow, since I’ve gained consciousness to operate socially on my own, I’ve definitely seen things other than what my elders chose to show. Well, that was important. Among the many things that were revealed, I noticed that random women you don’t even know, wouldn’t even bother knowing, have a habit of staring at you. 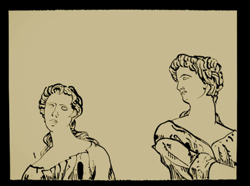 They leave no stone unturned to manage that desperate feat of staring at you from head to toe, threadbare. No matter where they are — in a bazaar, at some institution, public/private offices, cafes etc. I’ve had a fair share of women who had no interest in me other than what brand I was clad in. Hello women! many of you would agree with me here, unless you’re running on an attention deficit. I believe everyone deserves some attention but showering random strangers with such unreasonable attention is uncalled for. It makes the other feel uncomfortable at times. Unarguably, this is a subtle assault on those who are the victims of this unwanted attention. I could have shared little anecdotes, to link the broader concern with my personal sensitivity, but somehow I haven’t. I hear cries of feminism every day (some of which are raised by me as well) but that should not stop me from thinking and saying what wrongs are committed by women against women. While we are exhaustively engaged in fighting the misogynistic assault on women, here is a sketch of the mischief perpetrated by those who are not men. In doing so, I hope that such a pitiful and shallow display of one’s mind and priorities will be addressed and will prove to be a step forward to another milestone for women. Kung Fu To’a Martial Arts Classes from Jan 16 - Dec 31, 2012 from 4 to 5pm at Faiz Ghar from 4 to 5pm for age groups (5 yrs above). We used to go there with a lot of fervour. And we were always greeted by a Parsi gentleman who was a manager then. But for the regular visitors he was more than a manager — he was a guide who would indulge in book-talk with you and he’d exactly know what kind of a book you were looking for. I remember Ferozsons had a section for children which always attracted me. Away from parental control we used to sneak in and browse comics, which we weren’t allowed in school and at home. I can hardly recall a visit to Lahore which does not involve an obligatory pilgrimage to Ferozsons on the Mall. Such is the hold of Ferozsons over my past and present. When I lived in Lahore as a student in the eighties, Ferozsons was an essential port of call whenever I happened to be in the area. Ferozsons provided the much-needed window to the outer, wider outside world through books during the stifling period of General Zia-ul-Haq’s dictatorial rule. It was the place where book-watching spurred imagination to run wild. Since then, the Ferozsons has remained a permanent bookmark and landmark in my life. Even when I lived abroad for a long stretch of time, Ferozsons was never away from my thoughts of Lahore (both were, in fact, inextricably linked). Every time I visited Pakistan in those days, I made it a point to stop over at 60-Mall to take stock of where the country was headed through the type of books being sold and published. The idea that Ferozsons is no more is deeply unsettling as it has robbed me of a permanent anchor of my Lahore days and my frequent visits. Ferozsons and I go back to when I was a little girl. I remember back in the 1950s, there were just bookshops that I frequented and one of them was the Ferozsons of the Mall road. I feel sad that it got burned because I have a lot of memories associated with it. I can recall that whenever Dr. Taseer came to our place, I along with his daughter used to hop in his car to go to this famous bookshop and shop for books. My mother herself was a great patron of this shop for the sole reason that it was a contemporary bookshop and one of the only good one in Lahore back at that time. Likewise she always tried to inculcate the reading habit in us. Moreover, when it was my birthday, or when my father sent his poetry from the prison and we got them published and all the money that came from selling them, we spent it on books that were bought here. Gradually, the centre of Lahore shifted from the Mall to other places and it became very difficult to feel the same comfort that we once felt when we came to The Mall. I couldn’t bring my children here to share the same experience because in their time The Mall became so polluted, and anti-pedestrian as well — it just ruined the entire effort to enjoy the luxury of books that Ferozsons offered. I still remained a patron of Ferozsons when it had its branch opened at the Qaddafi Stadium although its outlet at The Mall was special because it was in such a beautiful building. Since the day the Ferozsons got burnt, I am in a fix of depression. I have many reasons to be sad about it but the foremost is that such a building got burnt which should not have been while all those which should have been burnt remain safe. This is one place that I have frequented since my childhood. Since I was in class 6 or 7 to the day I moved from my Laxmi mansion residence, I went there daily. 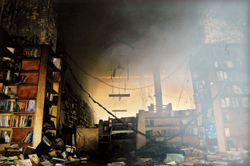 The fragrance of the books, the entire atmosphere of the shop is etched in my mind to this day. It was no ordinary bookshop; one went there and ended up making friends, meeting new people and hence became part of the cultural centre and learning that was Lahore. Back in my time, it was the only bookshop that imported contemporary European novels, foreign literature, English magazines and offered a huge array of products of books and stationary. I have strong sentiments attached to that place also because all the shelves that I had paid attention to during my youth gradually started to have my own books when I became a writer. It meant something incredible to me and it was a highlight for me when I saw that Ferozsons was publishing my books. Also I cultivated friendships with their salesmen. Those folks were unlike today’s personnel who check the inventory on their computers; rather they knew it if a certain book was out of stock or not. Well-read people themselves, they took the opportunity of suggesting you the books if you were their regular customers and they knew your taste. I just don’t have the heart to see a place that I’ve held so dear since my childhood in ruins. I have remained a patron of Ferozsons on The Mall for all this time before it was set ablaze, so much so that I have not been to its other outlets in Fortress Stadium and the Qaddafi Stadium. I am extremely attached to the building; it is one of the landmarks in Lahore of my time. As a publisher, I think Ferozsons has remained orthodox with its selection of work. I think they lacked the will to grow out of the lakeer ka faqeer attitude. “Only a dead chicken could be sold for this price,” says Muhammad Zahid, 40, a resident of Northern Lahore who is too fond of eating local food. His point is that if one counts the cost of spices, yogurt and other ingredients, and overheads like gas, labour etc, the price of chicken comes at around Rs70 to Rs80 per piece. Zahid’s reservations carry weight, keeping in view the fact that a normal-sized chicken costs around Rs200 to Rs220 if giblets such as kidneys, liver, neck are removed. The answer to his questions come from Qasim Saeed, a poultry shop owner in Samanabad. 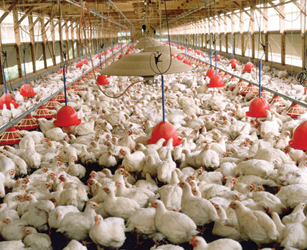 He tells TNS that poultry farms have recently been providing two types of chickens in the market. The first type was fully grown, ageing around 7 weeks and the second extremely undersized. “What if this small-sized chicken is procured by sellers of minced and boneless meat and caterers for the low price it offers?” questions Mudassar Durrani, an employee at a construction company. He urges the concerned government authorities to ensure that substandard chicken is not sold in the market. He tells TNS a farm owner who lost 4,000 chickens in a day did not wait for the remaining to die and brought them in the market. Normally, it is advised a chicken less than 40 days old should not be brought into the market as it does not gain the required weight before this time period. After the disease outbreak, chickens much younger than this age were brought to the market. This chicken is simply under-age and does not suffer from any genetic disorder and can be consumed, he clarifies. As the average distance between poultry farms have reduced due to heavy investment in this sector, fear spreads very fast. If poultry stock in a farm is affected, the neighbouring ones panic and start selling their stock without even waiting for a day. The situation was out of control as the strain of the disease was local and incurable. Fortunately, Dr Tahir says, the university has successfully developed a vaccine which is available at a highly subsidised cost and the disease is getting under control. “We are charging Rs250 to Rs300 only for 1000 doses. It’s a service for the local farmers as the price is unbelievably low,” he concludes.